If it’s springtime, that means that camping season is just days or weeks ahead. Prepper Mom, who writes at A Prepared Mother, submitted a list for my List Contest that I thought was too fun to not post. 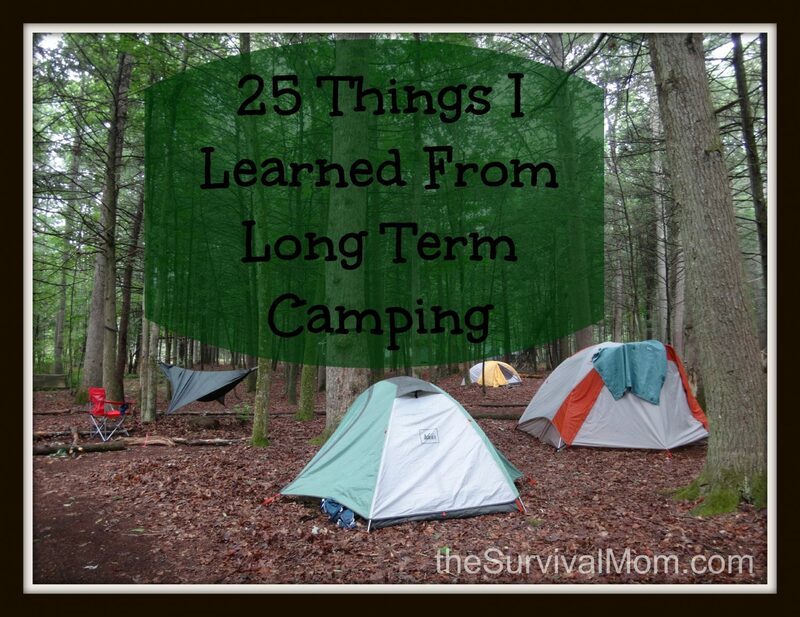 If you’ve ever gone long term camping, you’ll be nodding your head in agreement, and then will have plenty more observations to add to this list! If you fall asleep in in the open, don’t be surprised if you wake up with wildlife curled up with you. Nothing shiny is ever safe in the open from raccoons. Armadillos like to lick plastic and exposed toes. Make peace with skunks or your life will stink (literally). Always look where you’re taking a squat (answering nature’s call) at least three times before going. Make sure you know what bull thistle looks like. Don’t allow people to throw cigarettes in the latrines. Cedar smoke may be hard to live with, but mosquitoes are much harder to deal with. Don’t camp by still waters. Clear well the area where you put your tent. Rocks, briars, and twigs don’t just disappear because you put a tarp over them. Racoons will chew through things they cannot open easily. It’s easier to appease the raccoon than to keep buying new things. Shake your clothes well before putting them on. Wet tobacco makes fire ant stings stop hurting. You may not react to the first, second or 100th fire ant bite, but someday you will and get huge welts from them. Don’t camp anywhere near fire ants. No matter how awesome that spot in a valley looks, and no matter how much your significant other likes it, don’t camp there. Water ALWAYS goes to the valley. Do not attempt to burn American literature books. It won’t work. Raccoons can chew through sterilite containers. You cannot protect your valuables from raccoons unless you half bury a box in the ground and set a small boulder over it. Dont piss off Blue Jays. They remember and have no inhibitions in attacking you. ALWAYS, I repeat, ALWAYS check your shoes before putting them on. Things to add to camping better. 1. A tent with a floor is better than not, but it still needs a ground cloth – tarp. 2. Always zip or tie your tent closed at night. 3. Always change clothes at night (including socks and undies). Damp clothing from sweat will make you cold. 4. Keep a small flashlight on a lanyard under your pillow. Keeps hands free for late night nature calls. 5. Use Bear Bags, unless you want the bears to have your breakfast, toothpaste and clothing you cooked in. 6. Sometimes Duct Tape is more precious than gold. Always camp with it. 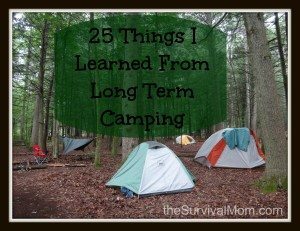 Little things and gal learned from camping with Boy Scouts. Before setting up your shelter or camp site look up in the trees for widow makers! 1. Check your back pockets before going to the outhouse. Nearly lost my debit card that way!!! 2. Urine has ammonia. Ammonia stops MOST stings…nuf said. 3. Raising your cooler 10 feet in the air will keep black bears out…but not the rarely seen grizzly. 4. Never run down hill…my youngest son can attest to that! 5. Always carry your own roll of toilet paper. It's not fun to drip dry in a rest stop outhouse…or worse! When you get back home, make a list of the things you wish you'd brought with you this time. That's one of my favorite tips for traveling and how I developed my master packing lists. Until you're actually camping or traveling, you don't know what will be the most valuable and useful. Conversely, there are things you packed that you never needed. Thanks for that extra tip! SMALL BROOM AND RAKE ARE GREAT IF YOU ARE CAR CAMPING. HARD TO CARRY IN PACK. A box of extra garbage bags are handy for many things. Teaching good camping manners, takes time, but worth the effort. If you need all or part of the tips above to go camping … Then Don’t. Camping is not for you, stick to a nice hotel. When pitching a tent, not only should you have a tarp under it (just to the edge of the tent’s footprint), but a trench about 3-6 inches deep should be dug all around it and, at the lowest elevation point, away from the tent about 2-3 feet to carry away any rainfall. There’s nothing worse than a wet tent floor (and it will get wet during a heavy downpour if the water isn’t channeled away) because that’s where your bag, clothes, etc., lies! Living in the rainy Pacific Northwest teaches you tricks to stay as dry as you can when tent camping. If you are accustomed to long term camping and the check points how to do a safe and secure, restful camp site, never bring a newbie to such camp with you. If you do you will live a training session for the long term of the camp. This is fine for the first 3 days or so, but is not very much good when you expect back up or common long term camping sense, and you do not get cognitive responses from the person or group that are newbies. Often there is a sense of, rely on someone else mind set, as they feel like a guest not a participant, and this takes them away from being a equal to support the effort in the long term. Take people that have a week under there belt of camping, at least 4 or 5 times before long term outings with you, and your group of long termers. Best is, if they did there beginning camping trips alone, as they will understand better some of the specific needs, and be a help instead of having that, GUEST, that you thought was going to help the long term camping effort, that sits, and stays longer in the sleeping bag, and waits for experienced or the equipment owner to do this and that, as they sit and watch, or just feel like they are a GUEST. Not good long term. This is not to say some characters will fit right in, if on there first time, long term camping, and get with it, and help the outing. Those are the doers in life usually, with skills. Most are NOT that the doer character types, at least if have observed such.